SHERWOOD — Revenge can be sweet — very sweet. "This is pretty big, especially coming off that first game," Sherwood sophomore lineman Bryan Cuthbertson said after the game. "Revenge definitely was a big factor. It was a big part of it. We really wanted to give them some payback for making our season start off a little rough." "Revenge was a huge factor. 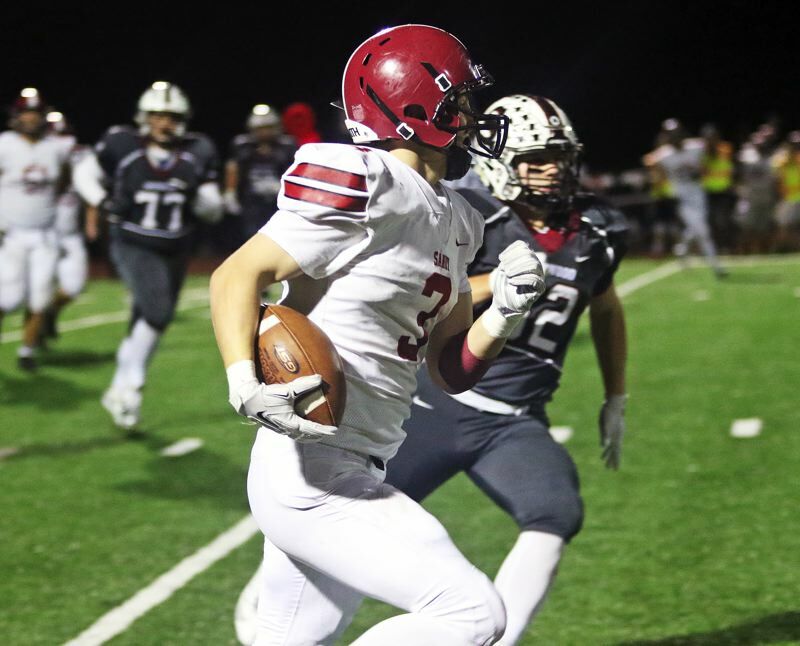 Week 1, we came in a little unprepared, but we've gotten so much better since then, and this felt great," said Sherwood junior running back Jamison Guerra, who scored a pair of touchdowns in the win. "We were really fired up, letting someone come into our house in Week 1, when we're trying to get our season rolling and get a loss. But, in the long run, we got them back, so that was great." 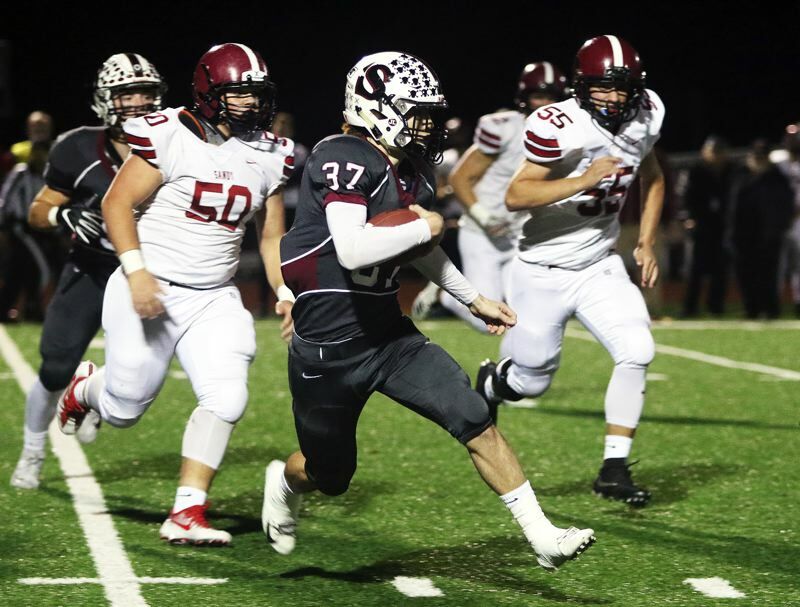 "It's a pretty big win, considering that we lost to them in Week 1," said Sherwood senior running back Ryan Scroggin, who ran for 102 yards and three touchdowns in the victory. "Revenge definitely was a big factor. We took that to heart. The first game, we overlooked them, because they came up from (Class) 5A. We knew we had to get after it, because it was our last home game, and it was a blessing that we were privileged enough to get another home game for our seniors." With the win, Sherwood, the No. 2 team out of the Pacific Conference, and the No. 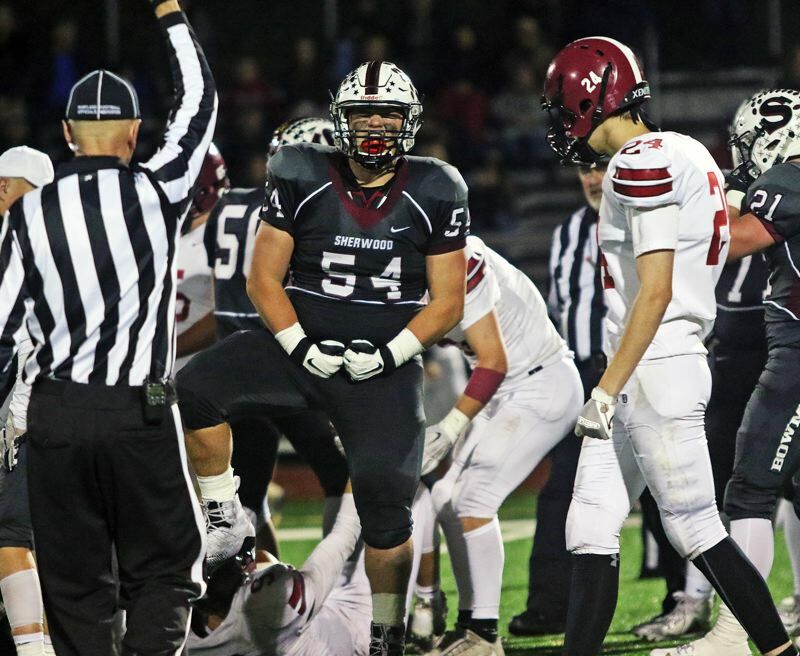 14 team in the final OSAA power rankings, improved to 5-5 on the season. 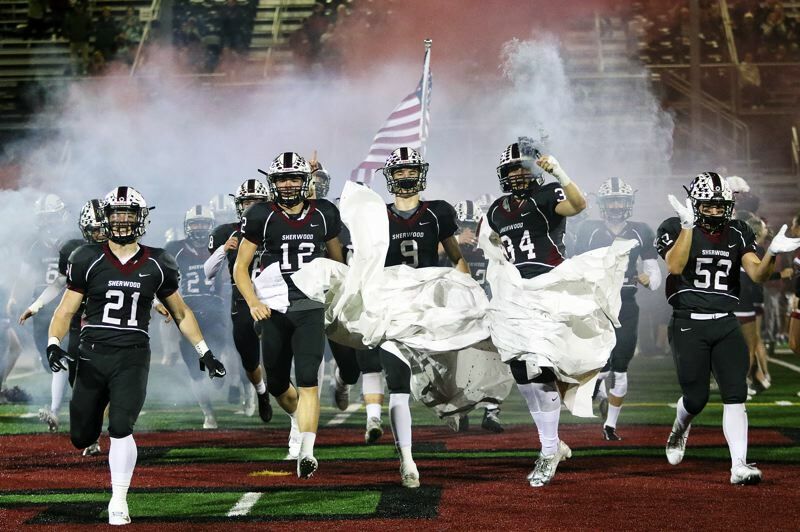 The Bowmen also advance to the second round of the Class 6A state playoffs, where they'll play at Sheldon next Friday. "You have to play every game like it's your last, and that's what we did tonight," Scroggin said. "This was pretty fun. I'm smiling right now. One week at a time, and we feel blessed to be still playing." Sandy, the No. 5 team out of the Mt. Hood Conference, and the No. 19 team in the power rankings, finished its season with a final overall record of 5-5. "I feel like we could have done better," said Sandy junior quarterback Chet Chamberlain, who had 149 yards of total offense in the contest. "But it was nice to prove some people wrong, because everyone thought we weren't going to make the playoffs. So, one of our goals was to make the playoffs." 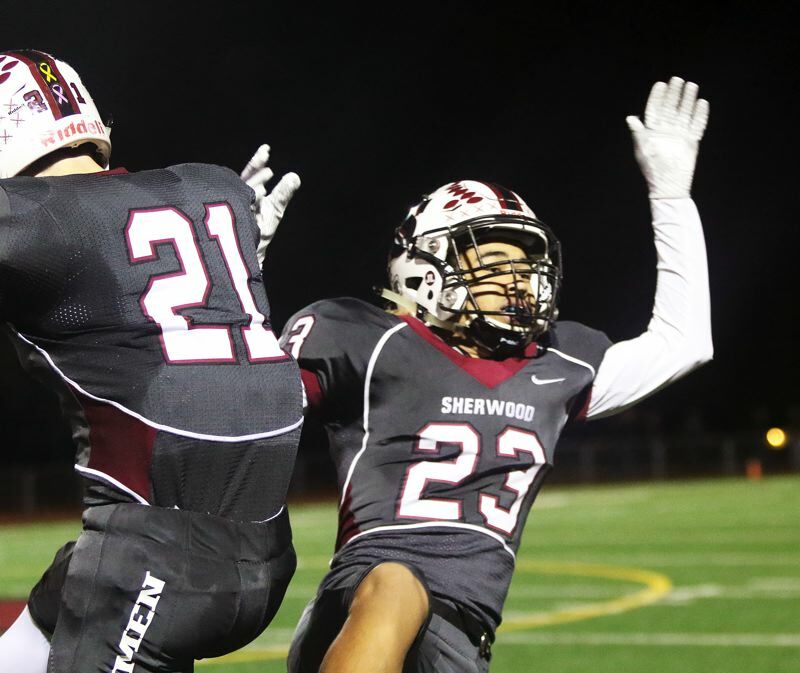 Sherwood, in Friday's playoff win, turned to one of its staples — the power running game. 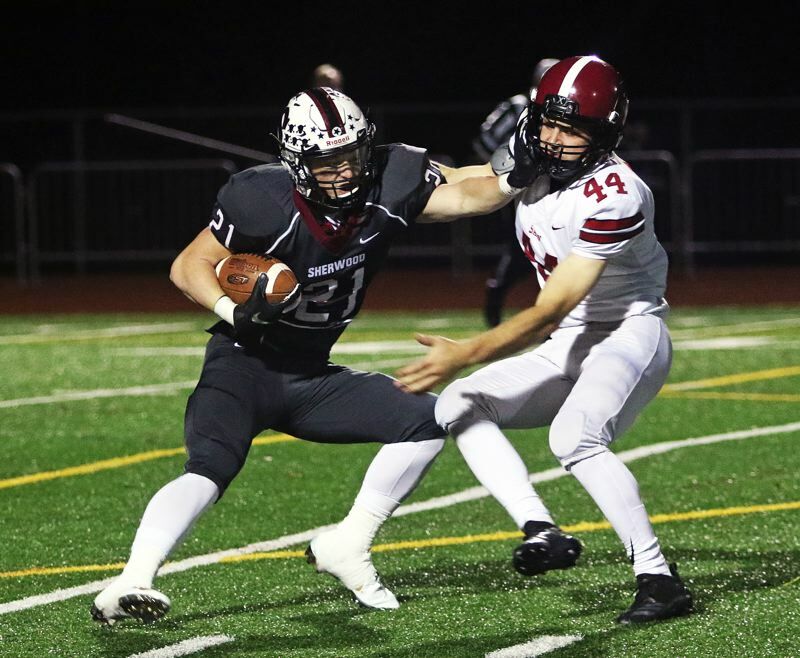 The Bowmen, as a team, ran for 478 yards on 47 carries, behind the blocking of linemen Cuthbertson, junior Nick Severson, sophomore Noah Culbertson, senior Carter Atkins and senior Jackson Barton, among others. "They tore it up," Guerra said. "I love those big guys. Without them, none of this is possible." 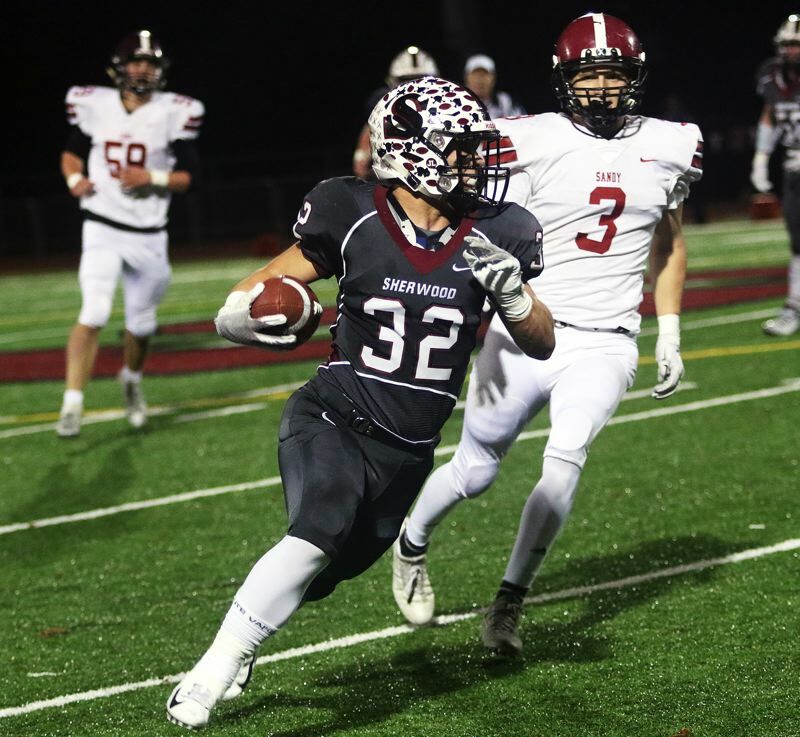 "Our running backs wouldn't get anything without our linemen," said Scroggin, who was one of three Sherwood backs to rush for more than 100 yards in the win. "You saw me hold onto their backs, they're flat-backing and I cut off of them. I give it all to our linemen, they're so good." "We take a lot of pride in it. Sherwood lives off the running game," Cuthbertson said. "We have good running backs. It helps that we can make big holes, but it also helps that we have running backs that run hard." 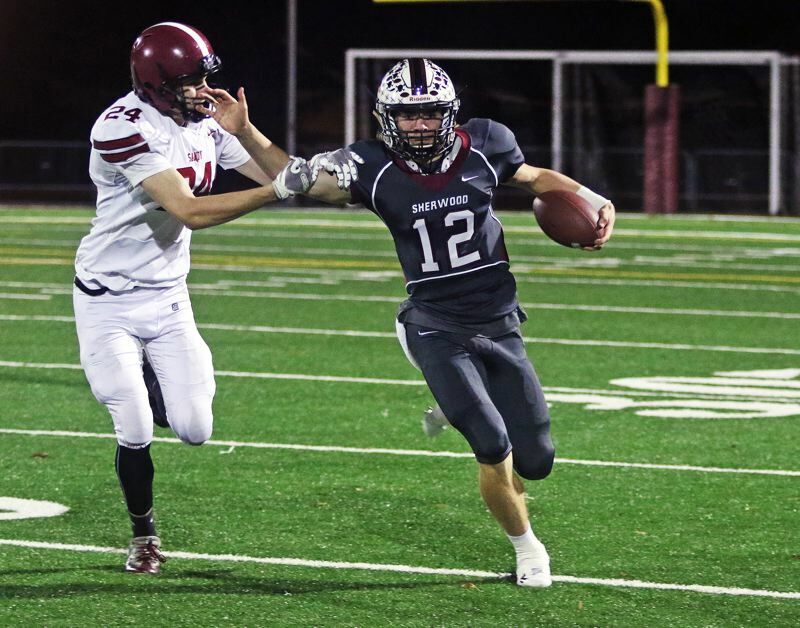 Sherwood turned to that running game the first time it had the ball on Friday. The running of Scroggin and senior Ian Stormont, mixing in a 36-yard pass from senior quarterback Cade Chidester to Stormont, moved the ball to the Sandy 2-yard line. Scroggin scored on the next play. 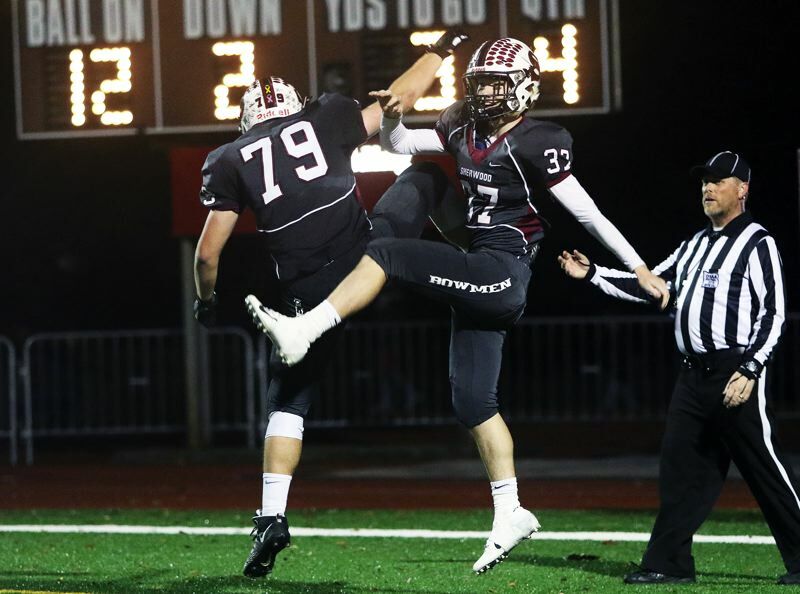 Junior Kaedin Steindorf added the first of his six extra-point kicks of the night, giving Sherwood a 7-0 lead with 6 minutes and 23 seconds left to play in the first quarter. Sandy answered right back in its first possession of the contest. Chamberlain completed four passes to junior Colby Carson during the 65-yard drive, including a 19-yard touchdown strike, which tied the game at 7-7, with 57.1 seconds left to play in the first quarter. But Sherwood would soon regain the lead — and keep it for the rest of the game. 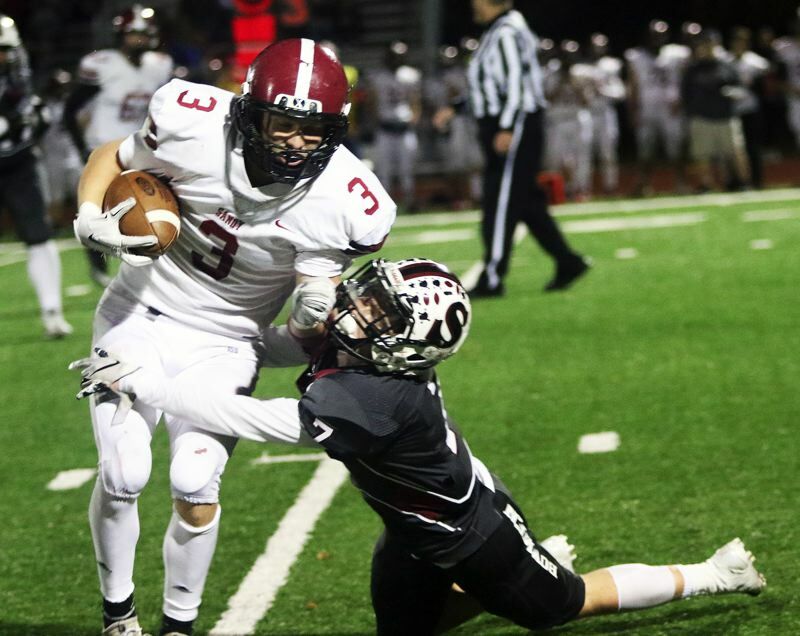 The Bowmen, on their ensuing possession, quickly moved the ball 80 yards in seven plays, all runs. Stormont and sophomore Clay Peden had the big gains, setting up Scroggin's 15-yard touchdown run to the right side, giving Sherwood a 14-7 lead with 9:41 remaining in the second quarter. On the next Sherwood possession, Guerra, zig-zagging around defenders as he sprinted down the right side of the field, scored on a 51-yard run to up the margin to 21-7 with 5:51 left in the first half. "I love getting out in the open field," Guerra said. "My linemen do the dirty work for me, and I love them. They're the ones that get me those touchdowns. I got out there, it was one-on-one, and that's my favorite. You get to put on some moves out there." Sherwood would take the 21-7 lead to halftime. 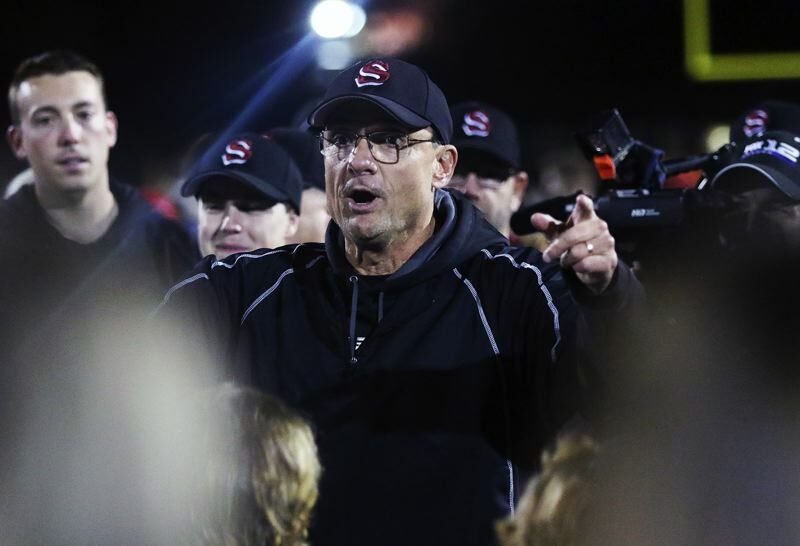 Sandy, behind the passing of Chamberlain and the running of senior Kael Schilperoort, tried to answer back in the opening possession of the third quarter, with the Pioneers moving the ball down to the Sherwood 29-yard line. But Sandy turned the ball over on downs at that point. Seven plays later, Chidester threw a 19-yard TD pass to Guerra, making the score 28-7 with 3:55 left to play in the third quarter. "It was there," Guerra said. "A little play-action, and when you're one-on-one at the goal line, you have to score." 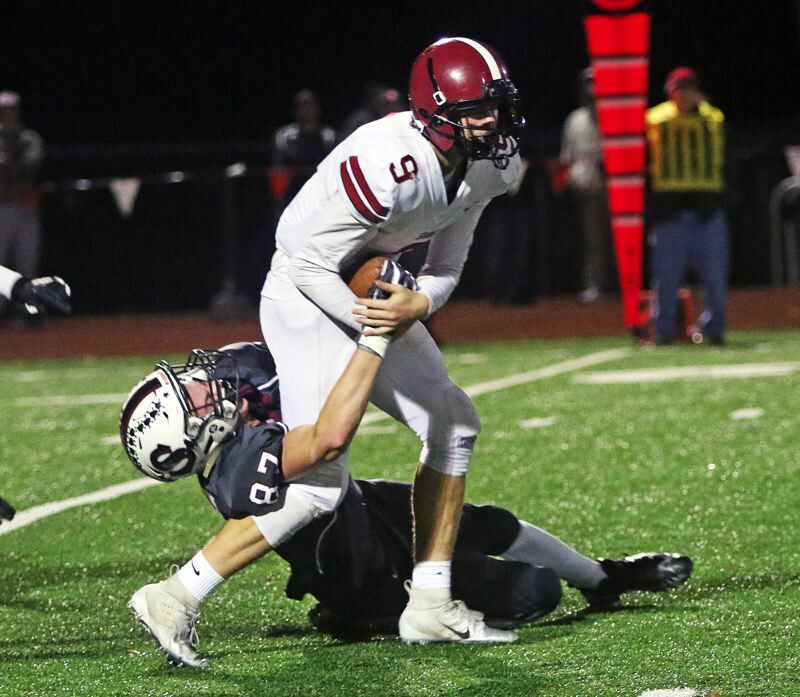 After Bowmen junior Blake Jensen recovered a Sandy fumble, Sherwood was at it again. 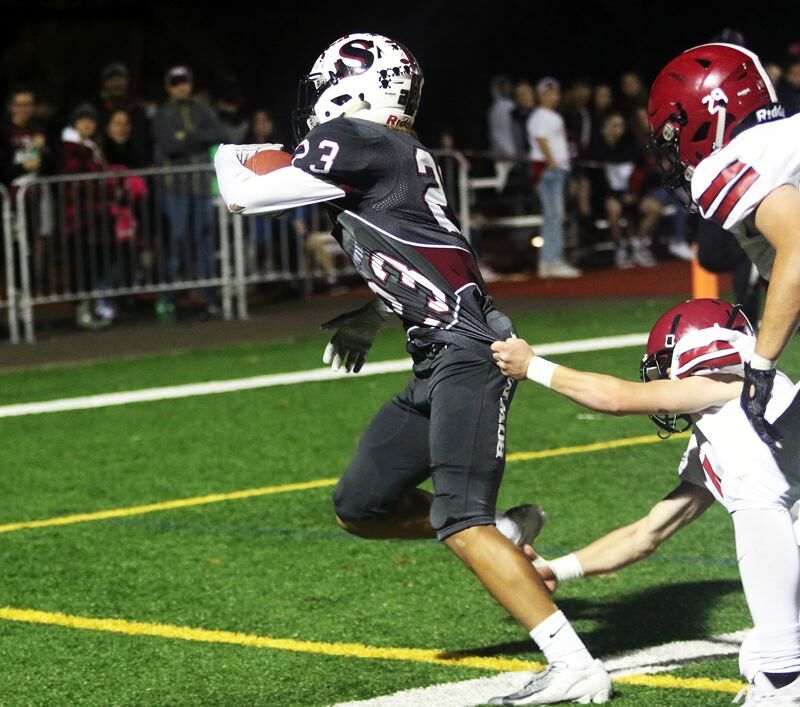 This time, it was Scroggin powering in to the end zone from a yard out, scoring his third touchdown of the game, and giving the Bowmen a 35-7 lead with 9:58 left to play. "Considering my (ankle) injury, and coming back, it felt amazing to get into the end zone and to contribute to the team," Scroggin said. Cuthbertson then had a pair of quarterback sacks on Sandy's ensuing possession, which led to a short punt, which Culbertson scooped up and ran back three yards to the Pioneer 19-yard line. That set up Peden's 12-yard touchdown run, which made the score 42-7 with 7:22 left to play. Sandy, still battling, put together a 76-yard scoring drive in what turned out to be its final offensive possession of the season. "That's what we do," Chamberlain said. "We don't ever give up. We just keep going until we can't go anymore." Schilperoort capped off the scoring drive with a 1-yard touchdown plunge coming with 1:20 left in the game, making the final score 42-14. "This feels good," Scroggin said. "Senior year, and I'm glad to play another game. We took we could from the first game (against Sandy), and learned from that. It's like a chess game, we're reacting to their plays." "This is huge, going to the second round of the playoffs," Guerra said. "It's a big game next week, and we're looking forward to it." Stormont led the Sherwood rushing attack in the win with 133 yards on 15 carries. Peden ran for 104 yards on seven carries and Scroggin had 102 yards on 14 carries. Guerra had 51 yards on two carries. Chidester completed two of three pass attempts for 55 yards. Sherwood senior Seth Bernhardt completed his only pass for 10 yards. For the Sherwood defense, which allowed Sandy just 231 total yards, Cuthbertson had two quarterback sacks, Jensen had a fumble recovery and Atkins had a tackle for a loss. "We kinda knew our defensive plan, especially after the first game," Cuthbertson said. "I think we were ready. Every night we were watching film, and we were ready." For Sandy, Chamberlain completed 15 of 18 pass attempts for 126 yards, and he ran for 23 more yards. 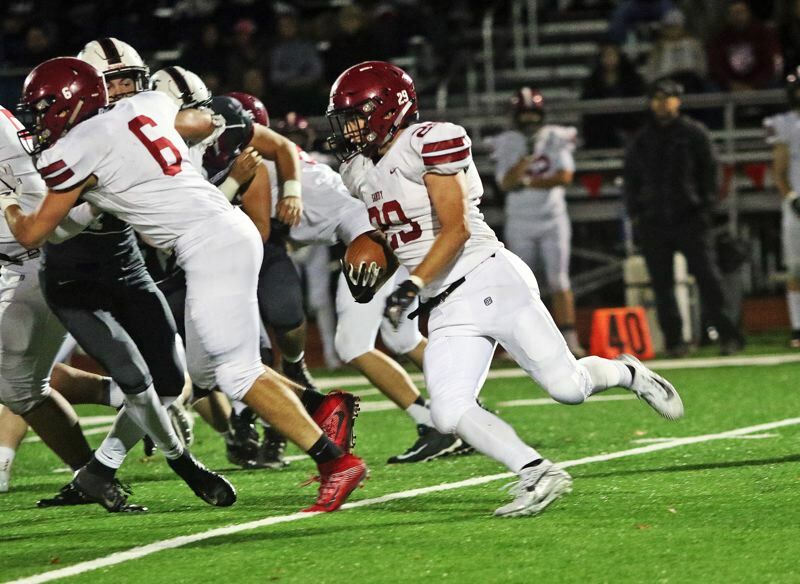 Schilperoort was the Pioneers' leading rusher with 38 yards on 14 carries. Carson had 10 receptions for 100 yards. 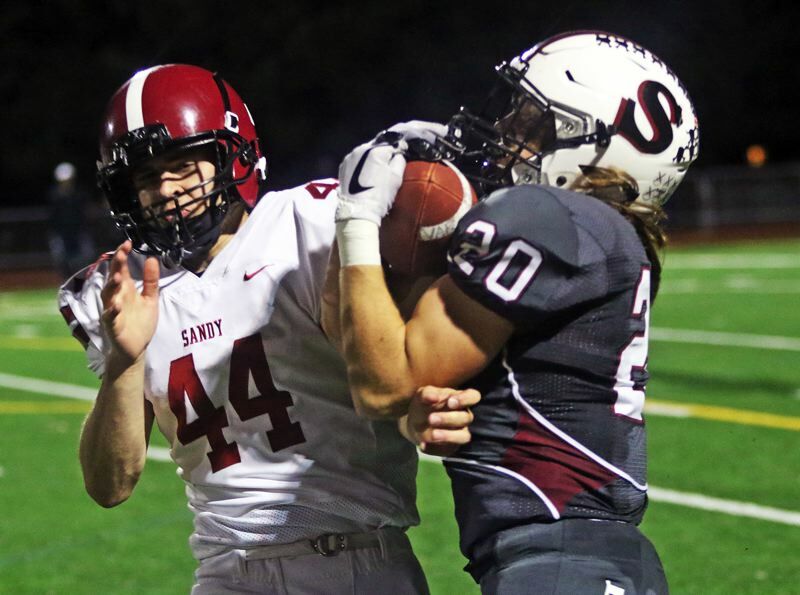 For the Sandy defense, junior Gabe Watowski, senior Dallin Thomas and Schilperoort each had a tackle for a loss. "I feel we had intensity, but today just wasn't our day," Chamberlain said. Sheldon, the Southwest Conference champion, and the No. 3 team in the power rankings, brings an overall record of 8-2 into next week's second-round match-up with Sherwood.